Should You Use Inspirational Quote Posts in Your Social Media Marketing Efforts? The use of quote posts is somewhat divisive - some people say they're annoying and shouldn't be used, others highlight them as a key tactic to boost engagement. Wherever you stand on the use of quote posts, the one thing you cannot deny is this: for a lot of brands and individuals, they work. Looking at the examples above, in the first, this was posted by 'Yogi Times' , a Facebook page with 315k likes. That's a big audience, for sure, but even so, that post has individually garnered almost 2k likes and 311 shares. Given the organic reach declines at Facebook, those sort of numbers are solid, even considering they're starting from a larger fan base than most. 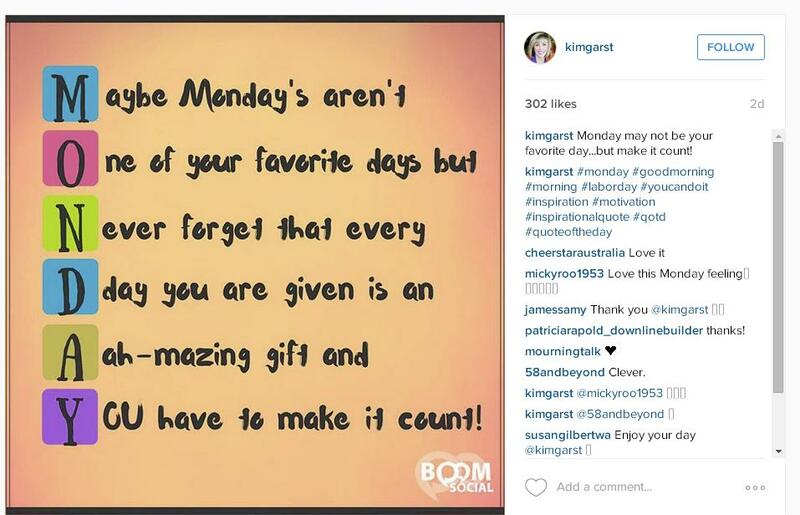 In the second example, posted by social media identity Kim Garst, that Instagram post has received 302 likes. Most brands would love to be seeing that level of engagement, and given their proliferation across the social sphere, you can see why more and more Page owners are leaning towards posting inspirational quotes to generate response. It's a difficult question to answer. When used well, quote posts can generate a heap of engagement - social media advisor Sandi Krakowski regularly posts inspirational quotes that generate thousands of Likes and comments on her Facebook page. The one with the most HOPE has the most influence. Shine brightly today! Sure, some gnarly people will get gnarlier but the majority will do their best to shine back. 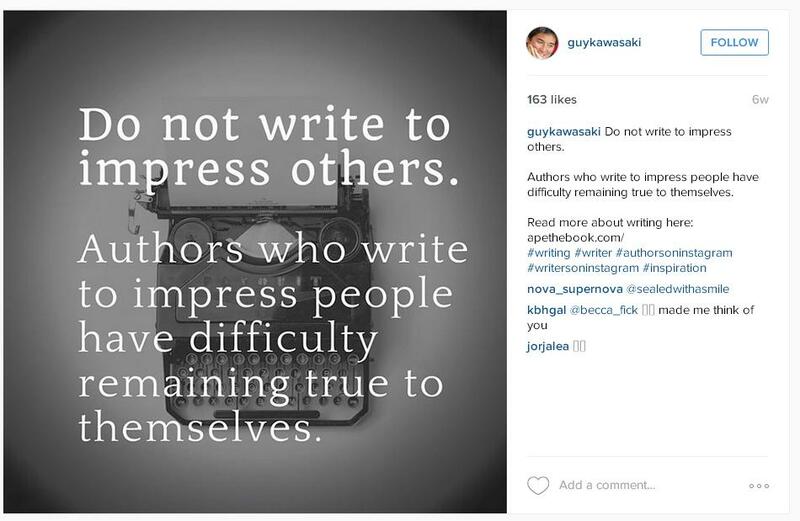 Even Guy Kawasaki, one of the most respected voices in social media, posts quotes (though his association with Canva is no doubt a contributor to this). Post Planner's Aaron Lee, a social media influencer in his own right, is a big advocate for quote posts. His view as that quotes are universally appealing, which widens the scope of your content. "Quotes work well because in general, people can easily relate to them, because of that, they get liked and shared easily compared to more targeted content." So, with so many industry leaders advocating the use of quotes, there's obviously something to them, right? Definitely quote posts do generate a lot of engagement - a search on BuzzSumo for 'inspirational quotes' shows that inspirational post content is generating a heap of shares, particularly on Pinterest. If Pinterest is part of your marketing strategy, then, it stands to reason that you should, definitely, be considering inspirational quote posts - but then there's also the other side of the argument. Inspirational quote posts, when done wrong, can just be annoying. As with all things social media, the content you post should be driven by your objective. One thing that you need to keep in mind is that even if people 'Like' one of your inspirational quote posts, that doesn't necessarily mean they're clicking through to see what your brand has on offer. The question is, are you boosting brand engagement through this type of content, or are you ramping up vanity metrics, like Likes, with no further path to your goal. Now, obviously, people have different objectives in this regard - social media influencers like those mentioned above trade on being able to generate engagement, and building their personal engagement numbers and followings is the name of the game for them. In this sense, it likely less of a big deal to them if they're only getting engagement with that individual piece of content - they're not necessarily driving their audience towards conversion in the same way a business is. But at the same time, they are building and maintaining personal brand awareness - and that's a key consideration, particularly in the modern Facebook landscape. For example, let's say you post an inspirational quote on Facebook and it generates 30 likes, 10 of which are from people who aren't fans of your Page. That then increases the likelihood of your next post being shown to those 10 new people - even if they only engaged with your quote post because they liked that individual piece, and have no interest in your business offerings, Facebook's algorithm will take their Like as an indicator of interest in your content, which then boosts your chances of reaching those people with future posts. In this sense, posting quotes to Facebook is likely a good move - but then it also comes down to the overall quality of your page and your subsequent material. Winning attention is one thing, but maintaining it is another entirely - but either way you look at it, posting inspirational quotes, when done well, can be a positive move. But then again, if you post a quote per day, and those posts don't resonate, that can also downgrade you in priority and lose you reach - a disastrous result. So what do you do? The key thing with quote posts is to ensure they have a strategy behind them. Don't just post the quotes you like, post the quotes that support the mission and purpose of your brand. In this way, you're not just sharing random thoughts, you're growing the ethos of your brand through this type of content. The first point in this process, of course, is to know your brand purpose and the 'why' of what you offer, beyond just your products and services alone. Once you know that, you can seek out inspirational quotes that support that mission, and thus, you're using inspirational quotes in a more targeted and focused way, aligned to your overall brand strategy. Use your own images where possible. I realize there are time and technical constraints involved, but you should always look to use your own, original images any time you post any visual content. Adding your own image to a quote post will make it much stronger, and much more in-line with your brand. You can use a tool like Canva for this - Canva makes it easy to put together images with text overlays for this exact purpose. You should also seek to maintain a thematic or stylistic consistency to your posts, so you're underlining your brand with each - eventually, people will get to know your style and associate that with your brand, even if it's not explicitly stated on the post. This is especially relevant when looking at your wider social media presence as whole, particularly in regards to Pinterest or Instagram. Seek out the best quotes which support your brand mission. Posting quotes about how much you love coffee might be tempting (and if you're a cafe or coffee brand, totally logical) but the best way to use quote posts is to ensure each one is aligned to your actual brand purpose and mission. In order to find great quotes specific to your niche, you can use a tool like Post Planner's content discovery engine, which has a specific section on quotes, or you can search Pinterest and find the most popular content. In the Pinterest search bar, type in 'Inspirational Quotes [your industry/offering]' and Pinterest will show you all the top inspirational quote posts related to those terms. Go through, find the most pinned quotes, then use them (with proper attribution), knowing that they've already resonated with an audience and are likely be popular. Don't go overboard. Yes, you could post three inspirational quotes a day and hope the engagement levels soar, but likely, you'll just annoy your followers - and get tuned out as a result. Consider the user experience and what you like to see from brands, and mix up your content to avoid overwhelming people with too much of the same. So should you use inspirational quotes? The evidence shows they can be powerful when used in a targeted way to boost your brand. But they're not an end unto themselves - if you want sustained engagement, you need to use them in support of your other great content, there's no point getting people's attention only to underwhelm them with an average experience elsewhere on your pages. Used in a measured, strategic way, quote posts can be a powerful tool, but, like all elements, they require strategic consideration. Built into your wider content and marketing mix, they can deliver great returns.